The main criterion for membership is an interest in urban & community forestry. The cost of membership is $10 per student, $25 per individual, $50 per family, $100 per government/business or $350 per patron. Learn more on our Membership page. Gloomy scale (Melanaspis tenebricosa)is a native, armored scale insect that feeds on the bark, branches, and twigs of trees. The insect feeds on tree sap underneath waxy protective material that resemble convex lenses and are referred to as “tests”. Gloomy scale appears to be more abundant in urban than forested settings. A positive association of scale body size and population growth with warmer urban areas and higher cover of impervious surfaces has been reported. The scale distribution range is wide occurring throughout the southeastern United States from Florida to Maryland and west to Texas. The scale has one generation per year. Heavy infestations cause branch dieback and canopy thinning followed by tree death in most serious infestations. Host: Most susceptible host is red maple (Acer rubrum) but other hosts include sugar maple (Acer saccharum), boxalder (Acer negundo), silver maple (Acer saccharinum), yellow poplar (Liriodendron tulipfera), elm (Ulmus spp. ), and sweetgum (Liquidambar styraciflua). Signs and Symptoms: Adult female covers, which are called tests, measure 2-3 mm in diameter and cover the bark of branches and twigs giving them a bumpy, warty look. The tests are dark gray to brown in color and are circular for females but more oval and smaller for males. Scale tests remain attached to the bark and are the best indicators for scale presence. Crawlers and nymphs can be observed during the summer, however. Mature females under tests are pink, wingless, and legless whereas males develop wings and legs but have a very limited life span. 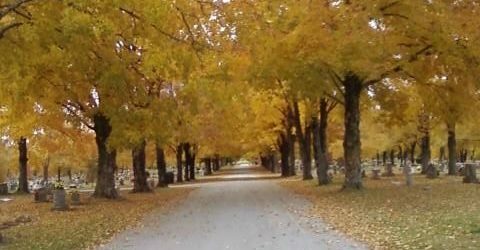 Management: Red maple trees planted in areas surrounded by impervious surfaces such as roads, buildings, and parking lots would be at more risk of gloomy scale threat. Matching species to site in planting operations is best preventive measure. Cultural practices that improves water and nutrient resources for trees would reduce hazard potential. Low pressure water sprays during dormant season can be used to remove scales in light infestations, whereas chemical treatments with foliar insecticides and/or bark oil sprays may be needed in heavy infestations when cost to benefit of tree removal favor treatment. For years, industrialization and deforestation have made a large impact on the number of trees in our towns and cities, and the results continue to worsen. More and more research is presented confirming the value and benefits that urban trees offer our communities, and it’s time for us to listen! Check out these five benefits of urban trees to help spark the conversation in your community today! Trees filter polluted air, provide shade and give an attractive, calming setting for recreation. Trees have been proven to have a positive impact on incidences of skin cancer, asthma, hypertension and stress-related illness. Planting trees remains one of the most cost-effective ways to help reduce harmful gases in the atmosphere. 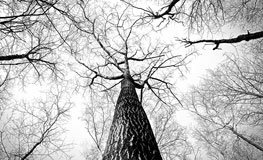 In fact, a single mature tree can absorb carbon dioxide at a rate of 48 pounds per year and release enough oxygen back into the atmosphere to support two human beings. Cities are, on average, two to five degrees hotter during the day than rural areas. This increased heat in cities can cause a number of problems, including general discomfort, respiratory impairment, stroke and even death. Having trees is the perfect way to stay cool during the hot summer months. Trees can help offset the heat through shade and evapotranspiration, thus reducing the costs of air conditioning and other cooling methods. Few things can compare to the visual appeal of green spaces in metropolitan and downtown areas. Trees add a sense of community and civic responsibility to neighborhoods and can even increase property values by up to 15 percent. Tree-lined streets add to a community’s natural beauty and can encourage foot traffic around local businesses. Researchers have discovered that trees and green spaces can help reduce crime. In a 2001 study, researchers found that “the greener a building’s surroundings were, the fewer crimes reported.” Trees are said to have a therapeutic effect, decreasing mental fatigue and its associated symptoms, such as irritability and decreased impulse control, both considered to be precursors to crime. Green spaces also encourage people to spend more time socially outdoors, which, in turn, discourages crime. If you want to learn more about how trees can benefit your community, check out our page on tree information. 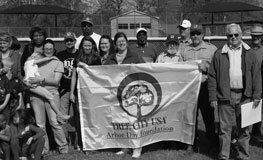 The Arkansas Urban Forestry Council (AUFC) honored three for outstanding work in planting and managing trees in their communities, as well as encouraging others to do likewise. The awards luncheon on April 17 was held at the Butler Center in Little Rock during AUFC’s workshop, Green Infrastructure Approach to Development – Improving Water Quality. Awards are for accomplishments in 2017. The 2018 Outstanding Community of the Year award was given to the City of Clarksville. The city, which has an ongoing beautification program, has its own greenhouse to grow seedlings. When seedlings are 3-5 feet tall, they are planted to replace failed trees or cover bare spots in the city’s four parks. The award was accepted by Jackie Verwiebe. Tri Cycle Farms, in Fayetteville, was recognized as the 2018 Outstanding Organization of the Year. Tri Cycle Farms, located on a two-acre, all low-impact site, is an urban food forest with a commitment to solve food insecurity problems in their community. The award was accepted by Don Bennett. The 2018 Outstanding Professional of the Year award was given to Kenny Smothers. He was recognized for going above and beyond his duties as an Arkansas Forestry Commission urban representative by helping promote urban forest efforts. All were presented a certificate of award and an autographed copy of Linda Williams Palmer’s book, Champion Trees of Arkansas. Go to our awards page to see pictures of the awards ceremony in 2018. The emerald ash borer (Agrilus planipennis; EAB) is considered the most costly and destructive invasive forest insect in the United States, killing nearly every ash tree (Fraxinus spp.) encountered. EAB is native to northeastern China, eastern Russia, Japan, and the Korean peninsula. Within its native range, EAB functions as a secondary colonizer killing stressed and declining trees. In North America, EAB was first detected and introduced in Detroit, Michigan. EAB larvae feed on the phloem and cambium of infested trees disrupting nutrient and water transport ability. 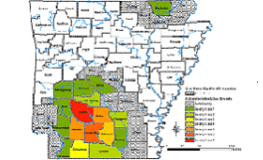 Currently, EAB is confirmed in 17 Arkansas counties with a total of 33 counties under quarantine (Figure 1). Detection surveys will most likely confirm additional counties before the end of the year. Host: Susceptible hosts include all species of ash, including green ash (F. pennsylvanica), white ash (F. americana), pumpkin ash (F. profunda), Carolina ash (F. caroliniana), and blue ash (F. quadrangulata). Green and white ash are the most common in Arkansas. White fringetree (Chionanthus virginicus), a native and an ornamental is also a suitable host. Symptoms: Adult beetles are iridescent green and are between 7.5 to 13 mm long. When wings are open, purple abdominal segments are shown. Adults emerge at the end of March continuing through July and can be seen resting or feeding on tree boles and leaves. 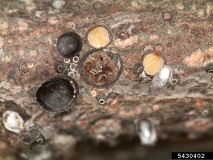 In severely infested trees, S-shaped larval galleries can be found under the bark. These galleries are packed with frass and widen with larval growth. Galleries end in shallow chambers used by prepupae over winter. EAB larvae are creamy white, legless, with bell-shaped body segments-last segment has pincer-like appendages. Infested ash trees initial symptoms include crown dieback and epicormic branching on the main bole followed by bark splits, woodpecker feeding holes, basal sprouting, and D-shaped exit holes on the main trunk. Conditions: Availability of host material seems to be the only limiting factor of EAB distribution and spread. EAB attacks healthy and stressed trees, although stressed trees are preferred. Trees as small as 1 inch in diameter are colonized, and foliage feeding by EAB adults occurs but causes minor defoliation. Open grown ash trees, such as yard and urban trees, are preferentially targeted by EAB adults.